Jayalalithaa made a plea to all political parties to back the former Lok Sabha speaker. Chennai, May 18 : A day after she announced support for P A Sangma's candidature for the presidential polls, Tamil Nadu chief minister J Jayalalithaa made a plea to all political parties to back the former Lok Sabha speaker. In a brief statement, the chief minister said, "I now appeal to all political parties to rise above political considerations and support Sangma and ensure that he becomes the next President of India." On Thursday, soon after Odisha chief minister Naveen Patnaik announced his support for Sangma's candidature, Jayalalithaa took political circles by surprise in quickly joining him in backing the senior parliamentarian. The move indicated that the issue had been discussed at length by the two leaders when Patnaik was in Chennai on a two-day visit recently for the Odisha Day celebrations. 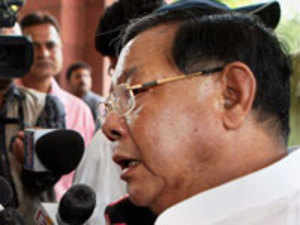 Sangma too had called on the Tamil Nadu chief minister on Tuesday last, accompanied by daughter and Union minister of state for rural development Agatha. In a statement on Thursday, Jayalalithaa made a strong bid for Sangma saying that in the past 60 years of the Indian Republic, while eminent personalities belonging to various communities and diverse walks of life had graced the office of the Rashtrapati, no one belonging to a tribal community had had this opportunity so far. "Sangma not only belongs to a tribal community but is also eminently qualified to be the President of our great nation," she had stated. Jayalalithaa's move to take centre-stage on the presidential polls is seen in political circles as a strategic step forward to grab a role for herself in national politics. During her rule in the state so far, Jayalalithaa has repeatedly attempted to position herself as a leader with strong views on national issues and displayed a desire to be more than a mere regional player.